Todd Gurley is the starting running back for the Los Angeles Rams in the National Football League (NFL). Even though he only joined the NFL in 2015, he has firmly established himself as one of the best in the league in his position. In just four seasons, Todd has been elected to the Pro Bowl on two occasions and finished the 2017 season as NFL’s leader in rushing yards. Get to know more here about this ‘once in a generation player’ including his bio, girlfriend, salary etc. Todd Gerome Gurley II was born on the 3rd of August 1994 in Maryland, Baltimore. He, however, grew up in Tarboro, Edgecombe County, North Carolina following his family’s relocation to that area. Gurley had his high school education at Tarboro High School where he excelled not only in football but also in basketball and track. He led his school to the 2A North Carolina State Championship title in three consecutive years. In his senior year alone, he recorded 2,600 yards and 38 touchdowns and was named North Carolina player of the year by AP. Asides from football, he was also phenomenal in track and represented his country at the world youth athletics championships in France in 2011. Despite all these exploits, Todd Gurley was not scouted by top colleges, a reason attributable to the fact that he came from a small mostly unknown town. For his college education, Todd attended the University of Georgia (UGA) where he spent three years from 2012 to 2014. In his rookie season, he started 12 (out of 14 games) and rushed 222 times for 1385 yards recording 17 touchdowns. He became the second player in the history of the school to reach 1000 yards as a true freshman and was named a first-team All-SEC by AP. Gurley continued his impressive form in the next two seasons, despite injuries and a four-game suspension by the NCAA. In 30 games for UGA, he amassed a total of 3,285 rushing yards and 44 career touchdowns (36 rushing, six receiving, 2 kickoffs) on 510 carries. The running back ranks second in UGA history in terms of career touchdowns (44), rushing yards (3285) and all-purpose yards (4,322). Todd Gurley called time on his college career after his junior season and declared for the 2015 NFL draft. He was selected by the Los Angeles Rams in the first round and was the 10th overall pick of the year. He was also the first running back to be selected that year. Gurley took the NFL by storm in his debut season. In 12 games only, he recorded 1,106 rushing yards and 10 touchdowns on 229 carries. He became just the second rookie in the history of the franchise (LA Rams) to rush for 1000 yards and have 10 touchdowns. The footballer was named the NFL offensive rookie of the year and was elected to the 2016 Pro Bowl. For his second season, the NC native got more game time but surprisingly returned poor stats. He had 278 carries but could only post a disappointing 885 yards and 6 touchdowns. Since that lethargic second season, Gurley has bounced back to his normal impressive form. In a stellar 2017 season, he rushed 279 times for 1305 yards and 13 touchdowns as the Rams won the NFC West divisional title and qualified for the playoffs. In recognition of his heroics, he was named the NFL offensive player of the week (weeks 4, 15, 16), NFL offensive player of the month (September and December 2017). He was also named the NFL player of the year and elected to the Pro Bowl. Following his stellar 2017 season, the L.A. Rams rewarded Todd Gurley with an unprecedented (for a running back) contract extension in March 2018. The deal worth $60 million dollars made him the highest paid running back in the NFL. His salary for 2018 is a mouthwatering $21.9 million. 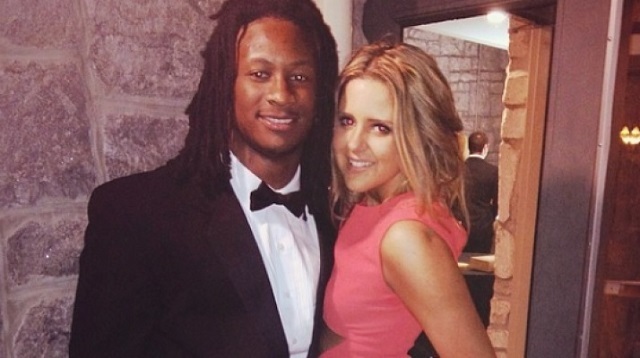 Todd Gurley had a very humble beginning. His family didn’t have much growing up but his mom taught him to still be thankful for the little they had. His mom’s name is Darlene Simmons and she works in a nursing home. His biological father’s name is Todd Gerome Gurley. Gurley has four half-siblings, three from his mom, Princeton, Shannon and Devin and one from his dad, Tarik. The footballer is a winner both on and off the field. He is in a relationship with the beautiful and intelligent Olivia Davison. She is a native of Bozeman and also an alumnus of UGA which is where they met. Olivia is an entrepreneur and runs her own business, an online clothing and accessory store named Liv Lively. She regularly attends her man’s games and they both post pictures of each other on their social media accounts. Todd Gurley is 6 feet 1 inch tall and weighs a respectable 224lbs or 101kg. He has an arm length of 31 ¼ inches and an NFL-worthy hand size of 10 inches. Gurley boasts of a rare blend of speed and power which has made him a professional and decisive runner.